Sandbank Holidays offer self catering accommodation near St Ives Bay, Cornwall. 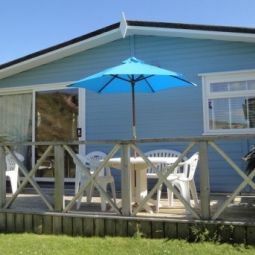 These well presented, clean and comfortable apartments and bungalows are ideally situated for exploring Cornwall and visiting the very best of the county's attractions. With accommodation sleeping from 2 to 6 persons, Sandbanks is a perfect choice for couples and families alike. The peaceful site is a relaxing place to unwind, and there is plenty of space for children to run around safely. A short walk to the beautiful beaches of St Ives Bay, and close to the coastal path and cycle trails, Sandbanks is a great choice for outdoor types looking to explore the Cornish terrain. Equally, being on the north coast, Sandbanks is a perfect base for surfing holidays, with great beaches and qualified instructors nearby. However you wish to spend your holiday, the friendly staff at this family run site are happy to offer their own recommendations for day trips, places to eat, and local pubs. Leave the A30 at Loggans Moor roundabout, taking the 4th exit signposted for Hayle. Turn right at the double mini roundabout after Lidls. After about a mile there is a very sharp left-hand bend and we are the 3rd entrance on the left following the bend.